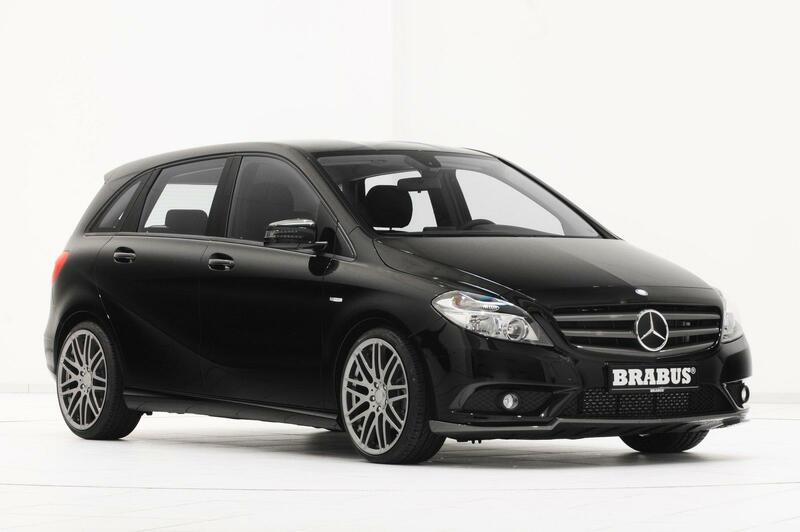 B as in BRABUS: Right on time for the market launch of the new Mercedes B-Class BRABUS offers an exclusive tuning program covered by the one-of-a-kind BRABUS Tuning Warranty® of three years, up to 100,000 kilometers / 62,000 miles (see BRABUS warranty conditions, updated November 2006). The program includes sporty-elegant exterior design, alloy wheels with diameters of 17, 18 and 19 inches, a sporty yet comfortable ride-height lowering, and exclusive accessories for the interior. 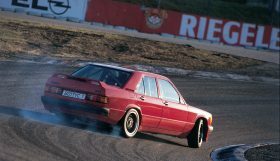 BRABUS engine tuning for the various gasoline and diesel models of the W 246 series is in preparation. 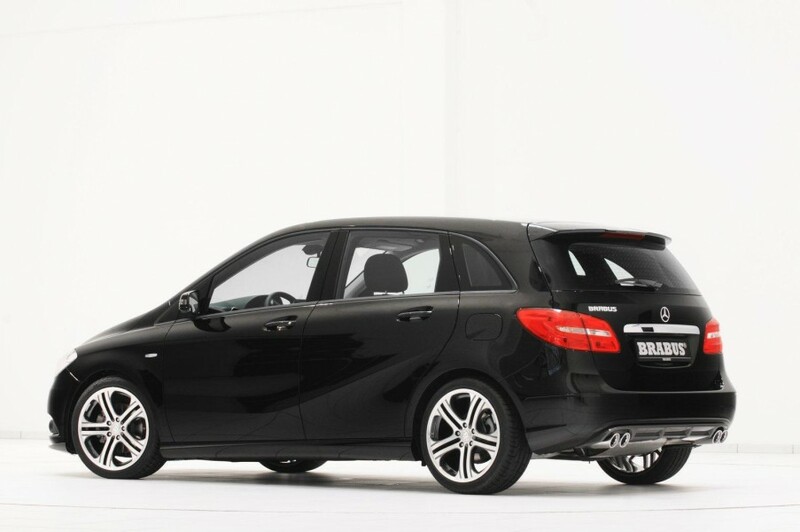 The BRABUS exterior program for the new Mercedes B-Class is characterized by sporty elegance that sets not only visual highlights, but also further optimizes aerodynamics. All components are manufactured in OEM quality from high-grade Pur-R-Rim plastics. The BRABUS front spoiler attaches to the lower part of the production bumper and thanks to its sophisticated shape reduces lift on the front axle. In order to provide the perfect backdrop for the BRABUS quad sport exhaust system, the BRABUS designers have developed an insert for the rear fascia that features two custom-tailored cutouts. 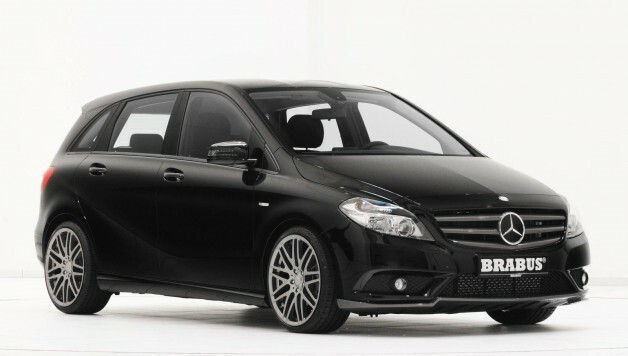 BRABUS alloy wheels specially developed for the new B-Class make a significant contribution to the exclusive BRABUS look and to further optimized driving dynamics. Five different designs are available: In the largest version with a diameter of 19 inches the Monoblock E, F, Q and S wheels have been homologated in size 8.5Jx19. 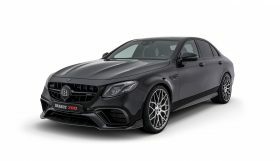 In the attached photos the new compact Mercedes is pictured on one side with BRABUS Monoblock F cross-spoke wheels with ‘Liquid Titanium’ finish and on the other side with Monoblock Q wheels featuring five double spokes, whose sophisticated shapes form five ventilation openings. The optimal tires for these wheels in size 225/35 R 19 in front and 255/30 R 19 on the rear axle are supplied by BRABUS technology partners Continental, Pirelli or YOKOHAMA. For a ride-height lowering by some 30 millimeters BRABUS offers sport springs that were calibrated specifically for use with the production dampers. While the fully stainless-steel BRABUS sport rear muffler with four chrome-plated tailpipes is available already for all engine variants of the new B-Class, the BRABUS ECO PowerXtra performance kits for the direct-injection gasoline and diesel engines are in the final stages of development. 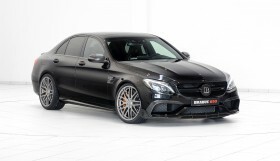 In the automotive world BRABUS is considered synonymous with individual exclusivity. 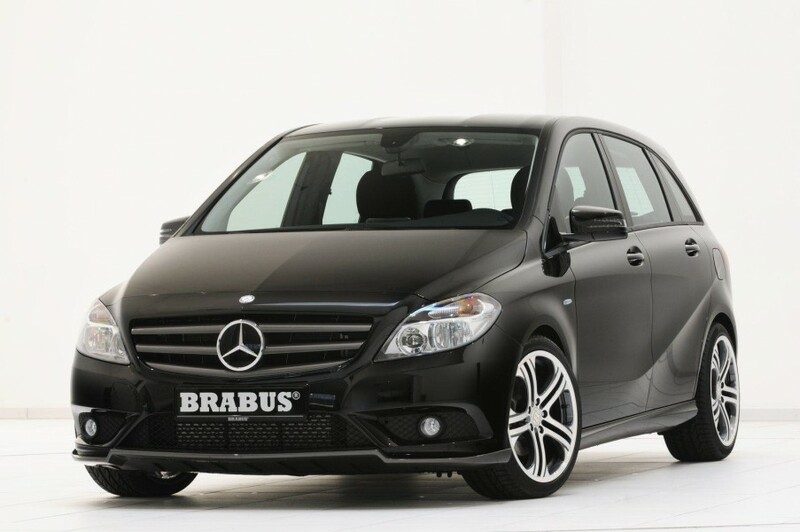 Naturally the BRABUS interior designers also thought about how to refine the interior of the Mercedes B-Class. What they came up with is as sophisticated as it is fascinating: Driver and passengers are welcomed by bi-color stainless-steel scuff plates with BRABUS logo. Aluminum door lock pins and pedal pads add sporty highlights. BRABUS gladly fulfills even more extravagant wishes in the company upholstery shop. Whether it is the completion of the leather equipment available ex-factory or the creation of an exclusive ambiance in any imaginable color: The BRABUS specialists transform the interior of the Mercedes B-Class into an exclusive lounge on wheels – by request also with multimedia equipment including an iPad.